The Winter Olympics in PyeongChang became an unexpected celebration of Korean unity with North and South athletes competing under one flag and the leadership of the two countries ready for high-level talks. But will the momentum continue after the games wrap up? We ask Chun Yung-woo, former national security adviser to the president of South Korea. Sophie Shevardnadze: Chun Yungwoo, former National Security Advisor to the President of South Korea, welcome to the show. It’s great to have you with us. Ambassador, the Olympics are over. We saw Kim’s sister shaking hands with President Moon Jae-in, sitting closely together at the Olympic stadium, smiling and exchanging comments. Is the great diplomatic breakthrough the press is expecting, the beginning of something, or is it all going to come back to being enemies now that the Games are over? Chun Yungwoo: Well, it depends on whether North Korea has the intention to denuclearize. If all these things are just to maintain as means of retaining their nuclear capabilities, we’ll go back to where we were before the Olympics or we could be worse off. This all depends on North Korea’s changing intention. SS: Pyongyang apparently wants to talk to the US. US says it’s open to talks with North Korea. But nobody wants to go first. What is Seoul’s role in this ‘who blinks first’ game? CY: Dialogue is important to figure out what North Korea’s intention is. But dialogue with South doesn’t resolve the problem unless North Korea is willing to abandon its nuclear programme and missile programme as well. So talks between US and North Korea could be even worse if North Korea has no intention to denuclearize because any talks which don’t lead to denuclearization or in which North Korea confirms its intention not to denuclearize under any circumstances could strengthen the hand of those in Washington who advocate a military option. So if nothing comes out of the talks between South and North or between North Korea and US, it will weaken those who look for a diplomatic solution. The talks can confirm that diplomacy is useless if North Korea has no intention to denuclearize. SS: North Korea has warned both South Korea and US against the resumption of annual military drills the two countries hold near the North Korean borders. My understanding is that they’ll go as planned. Will the drills annul all the progress made between the two Koreas at the Olympics? CY: Well, I’m not sure. North Korea has always been opposed to the joint military drills. I don’t know how different they are this year. But if they are desperate to reduce any pressure in terms of sanctions and military option which stand in the way of their ultimate goal of nuclear armament then, I think, the joint military drills can be only a temporary hiatus in the road of inter-Korean dialogue even at the summit level. SS: President Moon was invited to visit the North, and he replied to the invitation by saying that the two sides should ‘create the right circumstances to make it happen’. What would ‘the right circumstances’ be here? CY: I think, it’s important to know beforehand what kind of outcome the summit will produce because this summit could be worse than no summit if it doesn’t produce anything or if it only confirms that North Korea has no intention to abandon its nuclear missile programme under any circumstances. As I said, it will only justify the military option against North Korea. So that could be more dangerous than no summit at all. So he may wish to go to Pyongyang with a reasonable chance of producing a positive outcome that would lead to stronger peace rather than war. SS: Yeah, but where would he get the guarantees that the outcome will be positive? I mean, when you’re going to this kind of talks it’s a game of… You never know what’s going to happen - you take a chance, you take a risk. CY: It’s very dangerous to take a chance this time because it’s not just try and see if that produces anything. No positive outcome will, I wouldn’t say it will guarantee, but it will certainly strengthen the arguments for military option and it will drastically weaken those who believe in a peaceful diplomatic solution. That’s very dangerous. I think, through preliminary talks between South and North President Moon will have to find out how interested North Korea would be, what would be the chance to produce a positive outcome of the meeting. Otherwise we should be very careful not to fall in trap of those who are looking for a military option. SS: North Korea is accusing US of aiming to end the potential thaw between the two Koreas, US has been accusing Pyongyang of seeking to drive a wedge between Seoul and Washington. You rely on US militarily and you seek peace with the North - how does Seoul plan to maneuver in this blame game? CY: Well, I don’t think anybody is interested in an illusion of a peace, a false peace, a bubble of a peace. That’s not the same thing as a real peace. So what’s going on now is only producing a bubble, an illusion of a peace. It’s meaningless unless it leads to a real peace which can be guaranteed only by North Korea’s denuclearization. So the process of talks and the appearance of peace is one thing. But what US and the Republic of South Korea need is a real peace - a peace which is based on denuclearization. So, much will depend on how all these talks will lead to progress in denuclearization or to North Korea’s commitment to denuclearization. Any serious talks without North Korea’s commitment to denuclearization will go nowhere and we’ll be worse off in the end. SS: During the Olympics, President Moon was a charmer to the North Koreans, while Mike Pence ignored them on purpose saying that this ‘sends a message that North Korea has to abandon its nuclear weapons’. Do you think that was wise on his part? I mean, did he miss an opportunity for an informal talk or a preliminary talk, like you put it? CY: My understanding is that Vice President Pence was willing to sit down with the North Korean delegation in a meeting. But North Koreans refused to talk to the Americans just before the scheduled meeting. So the way VP Pence behaved at the opening ceremony was intended to neutralise the effect of the charm offensive the North Korea was producing in the Olympics. So I see nothing wrong in VP Pence’s attitude there. CY: No, that’s a speculation. But I think it was a smart decision for North Korea not to talk to the Americans because if they are not ready to commit to denuclearization meeting with the Americans is very dangerous. If that confirms that North Korea has no interest in denuclearization those who still believe in diplomacy will become the biggest losers in Washington. So I don’t think North Korea is ready to accept denuclearization at this point. And even if the meeting took place I don’t believe it could have produced any positive result. It was more likely to produce a catastrophe rather than a positive result. In that regard I think, whatever the reason North Korea was smart in some way to refuse to sit down with the American VP if they were not ready to accept denuclearization as a principle. SS: But, Ambassador, the US demands of North Korea are a very drastic thing - a complete abandonment of nuclear weapons. Do you think this “all or nothing” approach will work? CY: Well, it should be made to work. And denuclearization doesn’t mean anything if it’s not complete. If we allow North Korea to keep a part of its nuclear arsenal it’s the same threat for Japan, Republic of Korea and all who live in this region. It doesn’t make much difference. So this is not denuclearization. denuclearization is meaningless unless it is complete. SS: Your main thought seems to be that North Korea needs to denuclearize, completely and immediately. I recently spoke to US former Secretary of Defense William Perry who went on a historic visit to Pyongyang at 1999 and his diplomacy almost resulted in a deal back then, but it fell apart soon afterwards. He told me it’s now too late to make North Korea get rid of their nuclear weapons. Maybe it’s time to recognise the nuclear North Korea and just live with that? CY: Well, in my view that’s very irresponsible of him if he really said that. We know that North Korea attaches highest importance to nuclear armament. And the only thing that they value more than nuclear weapons is their survival. So I would admit that it’s more difficult to denuclearize North Korea now then when William Perry was special envoy or US Defense Secretary, no doubt about that. North Korea is far more advanced in their nuclear development at the time. And that’s why we need far greater and stronger pressure on North Korea now. Enough pressure to shake up their resumed stability alone will be able to convince North Korea that giving up nuclear ambitions is better than moving forward with their nuclear programmes. SS: Talking about pressure - for years, China has been supporting the North Koreans despite the hostile opinion of the world powers. Now its border with the North is getting tighter and it has implemented the new tough international sanctions. Does China not want to back North Korea anymore? CY: I think, it will be useless to rely on China’s voluntary cooperation because China wants two things - North Korea’s resumed stability and denuclearization - which is mutually destructive, they cannot go together. So as long as China wants denuclearization only to the extent that the pressure doesn’t destabilise North Korea, we’ll never succeed. So even though China is more cooperative than before, the sanctions that China has agreed to will not make a fundamental difference to North Korea’s strategic calculus. That will not lead to North Korea’s strategic decision to denuclearize. What we need is sanctions that will be tantamount to a total economic blockade on North Korea, that can really strangle North Korean into an economic disaster. Otherwise I see no reason why North Korea will agree to denuclearization. It takes greater effort on the part of the US to change China’s policy, not just rely on China’s voluntary cooperation. US alone has means to pressure China into changing its policy towards North Korea to attach higher priority to denuclearization than regime stability. SS: Can the tough international trade sanctions create a dangerous situation inside the North, cause a political crisis there? CY: I don’t think current sanctions will create a political crisis in North Korea. They have no unbearable difficulties in sustaining the current level of sanctions. What they are afraid of is tougher sanctions or a total economic blockade which may be coming in the months ahead. So the reason they try to embrace the South Korea is to avoid that kind of sanctions, to take a steam out of tougher sanctions and to avoid a military option from the US. SS: North Koreans usually want to get something before they get to the table - food relief, or sanction easing, or financial aid or trade agreements. Is there a danger of the North playing this game again - getting something it wants and then stalling the talks? Do you think the North seriously wants some progress to be made? CY: If we decide, or if the US are OK to ease the existing sanctions instead of toughtening them as a reward for their return to the negotiation table, that will kill the chance of any progress in denuclearization. SS: You say that sanction will pressure North Korea into denuclearization, but tough sanctions have been there forever, and here we are - Pyongyang has nuclear weapons despite them. How are you sure that more sanctions will actually work? CY: I don’t agree with you that there have been tough sanctions all the time. There have never been sanctions tough enough to change North Korea’s strategic calculus this far. There have been a lot of talk about sanctions, but no real sanctions that North Korea would be worried about. But only recently after their sixth nuclear test Security Council has decided to adopt the sanctions that can really bite North Korea. But the current sanctions are not going to change anything. There should be far tougher sanctions in place to change North Korea’s policy and calculus. So I don’t share the myth that there were sanctions all the time. Yes, there were sanctions - nominal, toothless sanctions, yes - but not the sanctions that are necessary to pressure North Korea into denuclearization, there have never been this kind of sanctions. SS: There’s been a push by Russia and China for a so-called “freeze for freeze” agreement - where the US halts the drills in return for Pyongyang halting nuclear activities. Do you feel this is a possibility? I mean, will the South Koreans agree to that? CY: I don’t think it makes sense. CY: North Korea’s retaining its nuclear armament is banned by the Security Council resolution. It’s illegal under the international law. Military drills have been there all the time, even before North Korea began nuclear development. They are defensive and these are not illegal. North Korea is conducting military drills all the time also. So I don’t think there’s a moral equivalence between what North Korea is doing and what US and ROK are doing together or international community as a whole are doing together. Another reason is that North Korea’s freeze means to allow them to keep what they have already built up in nuclear arsenal. And if they have no nuclear arsenal ‘freeze’ means at least postponing the time when they could build nuclear weapons. But they have enough nuclear weapons now to destroy peace in this region. And I think, only freeze, if it stands there for long, could be tantamount to legitimizing North Korea’s nuclear armament. CY: Of course, because the situation is very tough. SS: Hold on, let me finish my question. With this harsh approach, don’t you think that North Korea will be pushed into a corner when it would actually be obliged to fight back even harder? CY: It depends on how hard the sanctions prove to be. If sanctions are tough enough to create real existential problems for North Korea, I think, Kim Jong Un will think twice. He’s very smart. He knows how to accept manageable risks and how to avoid and hedge the bets. If the sanctions become tough and comprehensive enough to really bite North Korea, to strangle North Korea into economic collapse, then, I think, he will be more interested in a peaceful denuclearization then the demise of his regime. CY: I’m not really sure that President Moon really wants reunification at this point. I think, he’s more interested in peace through denuclearization at this point. Reunification is a distant dream and is not something that ordinary people feel on the skin. But when the moment comes people will think harder on the reunification. For the time being denuclearization and reducing North Korea’s capability of destroying peace on the peninsula comes before reunification. And that’s what, I think, most people would prefer as well. SS: Alright, Ambassador, thank you very much for this interview and insight. 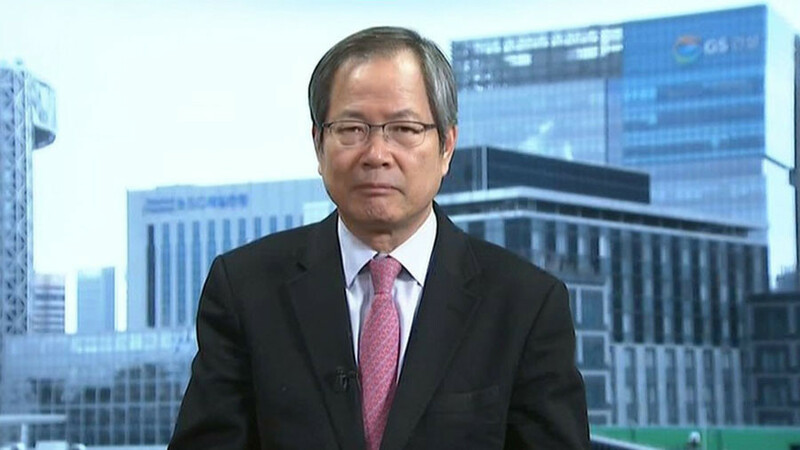 We were talking to Chun Yungwoo, former National Security Adviser to the President of South Korea about the ways out of the nuclear crisis on the Korean peninsula. That’s it for this edition of SophieCo. I’ll see you next time.